Above (centre) is an illustration I’ve recently been working on for a special Cardiacs inspired craft cider label in collaboration with Forest of Dean Cider producers Jolter Press. The cider in question is named ‘CORE’ and is one of two brews being specially produced for sale at The Whole World Window – Benefit for Tim Smith fundraiser concert. The concert, as the title suggests, is being organised by Greg Braysford and Jay Stansfield to help raise money to support the rehabilitation of Tim Smith, the leader of the band Cardiacs, who in June 2008 suffered a massive heart attack and stroke and is fighting a daily battle to get better. As a huge fan of Cardiacs and with a great respect for the unconventional musical genius mind of Tim Smith, I’m really happy to be able to help out in some small way to this worthy cause. 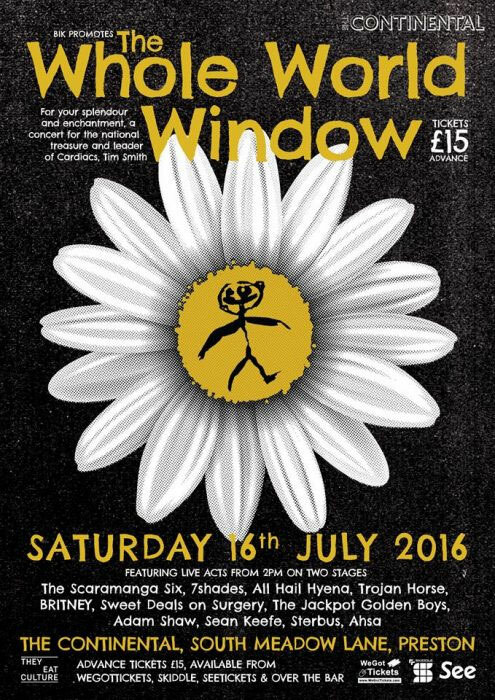 The concert takes place at 14:00 on 16th July 2016 at The New Continental, Preston, Lancashire with several bands and acts inspired by Tim Smith giving their time to perform on the day. All monies raised will go directly to Tim. Follow this link to find out more. Noel Storey has done the main artwork for the second craft cider named THE BIG SIP and I’m currently working on completing the final design layout for both labels and preparing them for print. So, if you like your music wonky and your booze zingy then get yourself along and enjoy these wonderful one-off Cardiacs craft ciders on what’s undoubtedly going to be a cracking fun-packed Cardiacs/Tim Smith inspired musical extravaganza! Here’s the official poster/flyer for the event (created by Stuart Box).